State Farm Mutual Automobile Insurance Co. cut its auto rates in Hawaii by an average of 5.4 percent effective yesterday. The reduction represents an annual savings of $5.7 million to the company's Hawaii customers. State Farm's overall rate level in Hawaii is now 41.4 percent lower than it was 16 years ago. State Farm, which says it insures one in every six cars in the state, said premiums for personal injury protection have decreased the most. The cost of the collision coverage also will go down for most customers while the price of the liability and comprehensive coverages will go up for some and down for others. Bank of Hawaii and Aloha Petroleum have reached an agreement to expand the bank's ATM network to include 31 Aloha Petroleum Island Mini-Mart company gasoline stations on Oahu and the Big Island. Installation will begin next month. 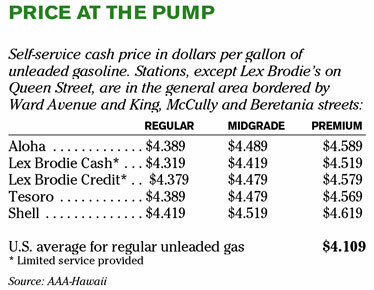 Bankoh already had ATMs in five Aloha Petroleum stations on Oahu. The bank's expansion will include the replacement of 18 ATMs that were owned by Hawaiian Island in Aloha Petroleum stations. The bank, which has the largest network of ATMs in the state, will have 417 in Hawaii, American Samoa and the West Pacific once the machines are put in the Aloha Petroleum outlets. 'Umeke Market Natural Foods & Deli expanded yesterday from its flagship Kahala store into downtown Honolulu's Bishop Square. The deli, which will be open from 7 a.m. to 4 p.m. Monday through Friday, offers breakfast and lunch items and also will cater for businesses in the area. A portion of yesterday's proceeds will be donated to former Aloha Airlines employees and their families. Australian food processor Buderim Ginger Ltd. said yesterday it has extended a share purchase plan to allow shareholders more time to consider its half-yearly results and its proposed acquisition of MacFarms of Hawaii LLC. Buderim said earlier this month it was undertaking a share purchase plan to provide funding flexibility for acquisitions. The plan, which was expected to close on Friday, has been extended to Aug. 15. The company said it expects a buyout of MacFarms to close in early August, after it signed a non-binding letter of intent July 1 to acquire the second-largest macadamia nut processor and marketer in the state. Longs Drug Stores Corp. said yesterday it has entered into an agreement to connect with Microsoft HealthVault, a consumer health platform for sharing information with patients and providers. The program, expected to launch this fall, will make Longs one of the first pharmacies to allow customers to access their medication information share it with others on www.healthvault.com. » Starwood Hotels & Resorts has named Nona Tamanaha to regional human resources director for Hawaii and French Polynesia from area director of human resources for Waikiki. She joined the company in 1986 as a personnel/training secretary and has also served as assistant director of human resources and human resources/benefits manager. » The Fairmont Kea Lani, Maui has named Cindy Cagle as regional director of sales and marketing. Her previous jobs include director of sales and marketing at Elbow Beach Bermuda Hotel and SunBurst Resort in Scottsdale. She has more than 20 years experience in hospitality sales. > Pacific Focus has named Jason Suapaia as president. He will continue his duties as executive producer. He has worked with the firm since 1993. » Outrigger Enterprises Group has named Panjama Learnsuwan as director of sales and marketing, Outrigger Hotels in Thailand. Her previous jobs include director of sales at Alila Hotels and Trisara, Phuket, and other sales and marketing positions at the Layan Beach Resort, Laguna Hotels & Resorts and the Diamond Cliff Resort and Spa. » Wahooo Seafood Grill and Bar, not to be confused with Wahoo's Fish Taco, has hired Beth Haddock as general manager. Her 24 years of restaurant, convention and retail experience include Hilton Kauai Beach Hotel, Aloha Beach Hotel, Westin Princeville Resort and Dukes Canoe Club. ‘Umeke Market Natural Foods & Deli was incorrectly called ‘Umeke Market National Foods & Deli in a briefs column on Page C1 Tuesday.